A new Revenue web security measure means that all pre-2014 Digital Certificates for the ROS system will expire on 27 March next. In the meantime, ROS users will be prompted to renew their Digital Certificates and update their passwords. This is a very simple process which takes less than 2 minutes to complete. 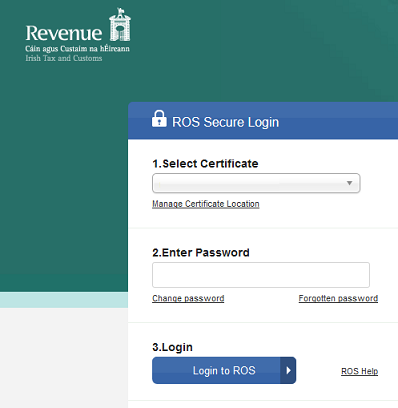 If you are an infrequent ROS user, you should ensure that you log on to the system before 27 March, and update your Certificate. Otherwise it will expire and you will then have to apply for a fresh Cert before you can again access ROS. The Revenue eBrief on this issue is here. bought me breakfast simply because I stumbled upon it for him..
lol. So let me reword this.. Thanks for the meal!! I’ll check back lager and see if the problem still exists.